- Payment is required to secure your place in the class. - If you must cancel and do so at least 48 hours in advance, your fees may be applied to a future class. - Cancellations fewer than 48 hours in advance will not be eligible for refund. - After you register for a class, we will email you the supply list & homework (if there is any). - For classes requiring material, we kindly ask that you purchase materials at A Little Knitty, recognizing that you may already have suitable needles and notions. - Please note, our Classes are held upstairs in the loft and there is not an elevator available in our old building. We don't want anyone to feel left out...so if you have mobility issues, please let us know and we can make arrangements to hold the class on the main floor. Do you have a project (or two) that you are stuck on? Do you just need a little guidance to get started on that sweater you have always wanted to knit? Do you have questions that pop up while you are crocheting? Stitching Circle is for you! 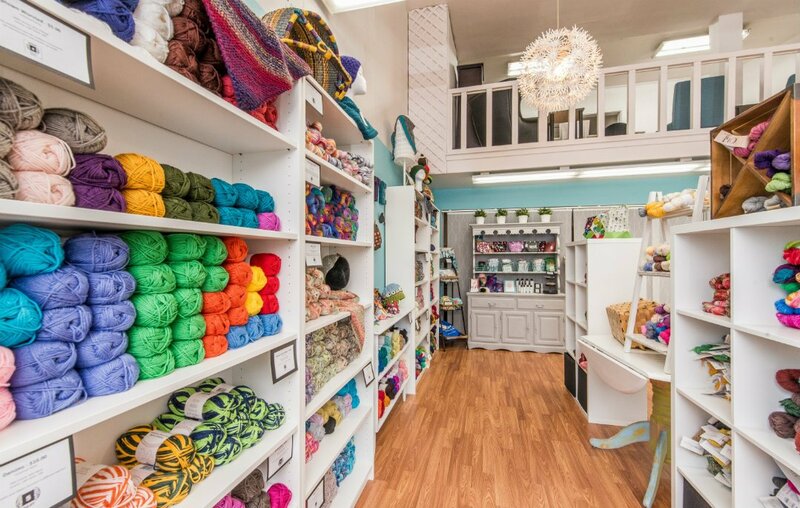 Our expert, Sandy will bring her many years of yarn crafting knowledge, you bring the project/questions. This is a great time for you to work and then as something pops up, you can get hands on help and advice! Sessions are $10 each, sign up is not necessary (drop in is great)�however, space is limited! Mother's Day Kumihimo Bracelet Class - $40 - 4 Hours - Instructor: Sandy Buzzelli Saturday, May 11th 10am to 2pm As knitters and crocheters, we all have leftover bits of yarn in our stashes. Kumihimo, a Japanese form of braiding, can be a perfect way to use up some of those leftovers. 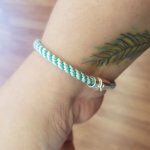 In this class, we'll make a bracelet as we learn the kongoh gumi, an 8-strand round braid. We'll also explore ways to incorporate these round braids into our knit and crochet projects. This is the perfect class to take with your child or your mom. Great for ages 12 to 112...we just ask anyone under 18 have an adult with them. This class contains a kit which includes all the supplies needed to make the kumihimo bracelet class project. We will also have scones & tea to enjoy while crafting! Recently I have been giving thought to doing a Sweater-a-Long. What I envisioned was a 2 month help session for someone attempting their first sweater. I mentioned this brainstorm during Sit-n-Stitch and I was met with excited faces and many YES!!!!! So here is more information about the Sweater-a-Long. We have a great group of kids that have been learning to knit and crochet, so we have started a Thursday evening Kids Klub! This is a time for kids 8 to 18 to learn to knit or crochet...or keep learning. Students will need to bring a project they are working on, or can purchase a starter kit for $10! Each session is $15 or you can purchase a punch card for 4 sessions for $40!